Architects and designers look forward to a time when we’ll all take the train. America’s high-speed rail initiative; Developing countries such as China pouring billions into transit infrastructure; Cataclysmic oil prices–all signs point to a future filled with trains. An exhibition on view in downtown L.A. through the end of the month, LA Beyond Cars: a Global Perspective on Rail and Public Space, includes dozens of projects that envision this future, from passenger stations to new business models for shipping our goods. Up top: The interior of a rail station designed by Zaha Hadid, the New High Speed Station Napoli Afragola in Italy. The station serves as both transit hub and a new gateway to the city of Naples. The design uses a large overhead concourse that spans the width of the structure which can be used to access the trains but also can be used as a public bridge, allowing passengers and residents to use a new urban link that connects the two adjacent neighborhoods. Below: The Bologna Central Station, or Cittia Sospesa, connects northern and southern Italy as well as many different types of transit, allowing city streets and all their traffic to weave in and out of the station itself. The complex, designed by MVDRV is meant to be used for transit but also serves a vital role in the city itself since the roof of the Cittia Sospesa offers shopping, office buildings, and public space for both travelers and the citizens of Bologna. 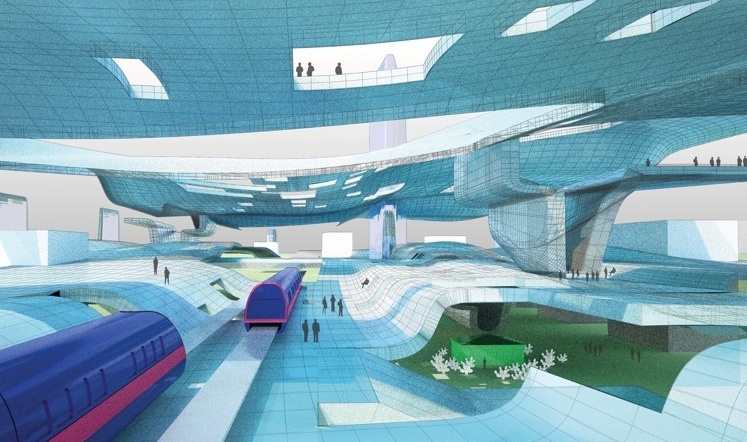 MasTransit proposes a transit system for the Los Angeles area that functions more like a large circular route, like Tokyo’s Yamonote line and Chicago’s Loop. L.A. would become its own rail system that syncs up to the statewide high-speed rail system but delivers the same speed and service on a more regional scale, solving the problem of serving sprawling areas throughout the city. This proposed station would be one of many mega-hubs found in the area. 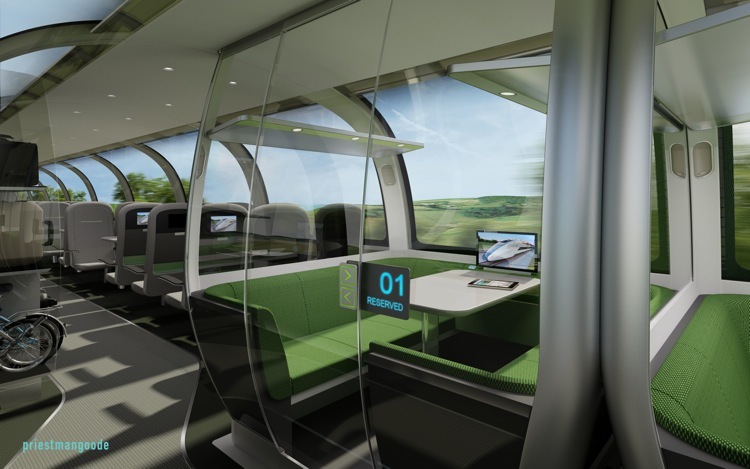 The recently unveiled Mercury is a double-decker high-speed train designed by Priestmangoode that travels up to 225 mph. The interiors use sleek finishes and lots of glass to allow for interaction, space, and relaxation without compromising on privacy. More like a chic hotel than a train, the Mercury features a range of seating from commuter seats with entertainment systems to private, soundproof berths for families or meetings. Kids will have a play area on the train and a luxury section will have an exclusive lounge and bar. Sometimes, there are places which are better served if transit is hidden–especially in park-poor neighborhoods. Located in the Munich district of Theresienhoehe, this unique railway cover designed by TOPOTEK1 and Rosemarie Trockel hides the railway below acres of “recreational carpet.” The space serves as a type of front lawn for the burgeoning residential area surrounding the park, where residents can use the rolling hills of synthetic and authentic grass, foam mounds for climbing, as well as a giant sandbox and gym equipment. 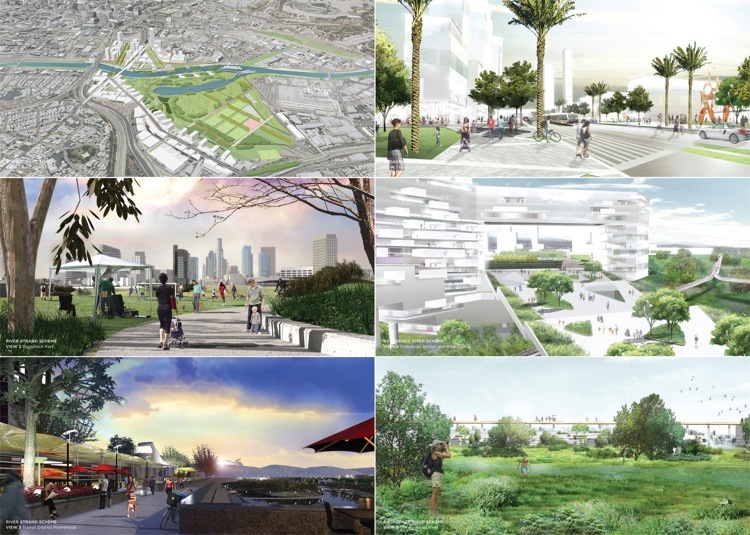 Also in Los Angeles, the recently proposed Piggyback Yard Conceptual Master Plan envisions high-speed rail as the centerpiece for a vast public park that will include a revitalized and restored Los Angeles River. The park would be unique in that the transit corridor and adjacent mixed-use development and arts complex are designed to live in harmony with open space, ecological restoration, and flood water detention. As trains will transform the way we travel, they’ll also transform the way we ship our goods. SpedEX is an investigation by XChange Architects who believe that high-speed train system could handle the short-to medium- haul just-in-time freight forwarding networks which are running out of space at the nation’s busiest airports.